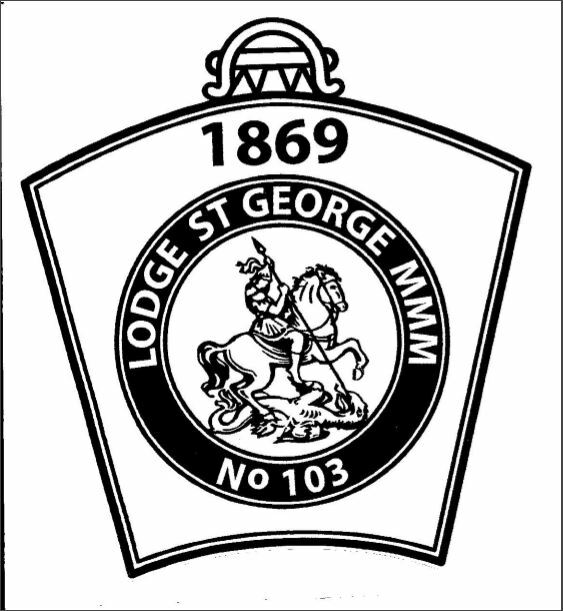 St George Mark Lodge is a friendly group of men, ably supported by our Ladies. We are currently enjoying a period of growth and renewal. The Lodge was founded in 1869 with the number 103 on the Roll of the Grand Lodge of Mark Master Masons of England. 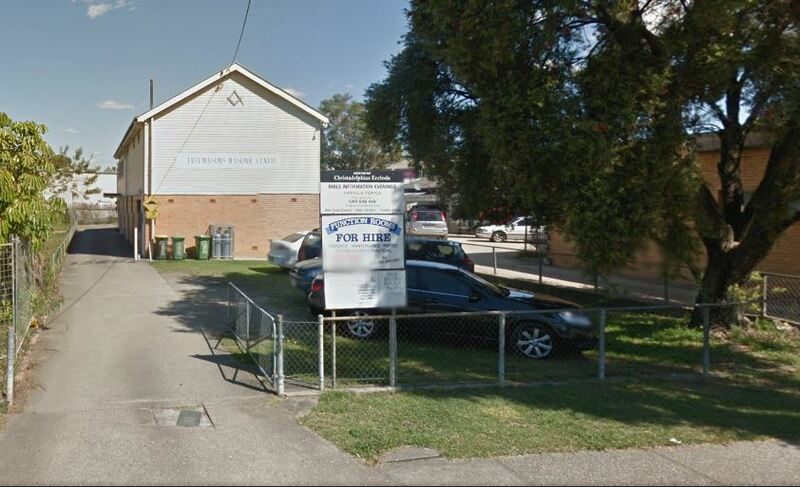 The Royal Ark Mariner Degree was added in 1892 and, in 1932, St George became Lodge number 1 of the new Grand Lodge of Mark Master Masons of Queensland. Many fine Queenslanders, both famous and humble, have graced St George's membership. Some of the better-known were Sir Samuel Walker Griffith (Chief Justice of Australia), Hon. Charles Holmes a Court (Clerk of Queensland's Legislative Assembly), Sir Augustus Charles Gregory (Surveyor-General of Queensland), Sir James Dickson (Premier of Queensland), John Petrie (Mayor of Brisbane), and Bishop William Stevenson. 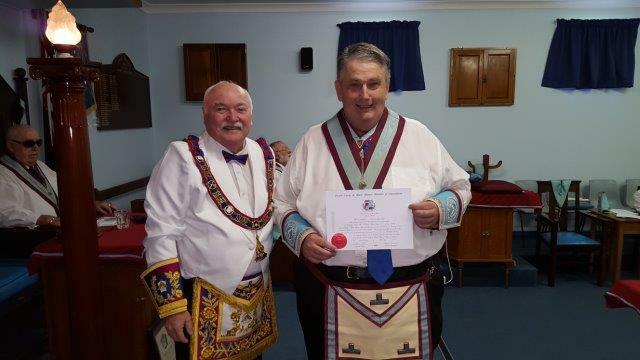 Steve Finkling and Adam Rauber displaying their Mark Master Mason Certificates. 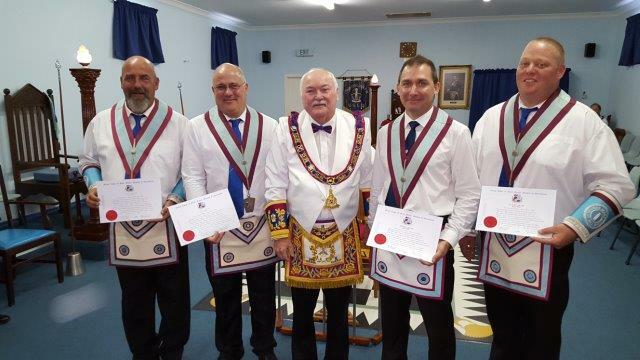 We will celebrate the 125th Anniversary of our Royal Ark Mariner Lodge in January 2017 and the 150th Anniversary of our Mark Lodge in January 2019. Special commemorative medals (Jewels) will be struck for the occasion and presented to all members on both of these occasions. The Lodge meets on the Third Saturday, March, May, July, September, Nov.
St George is a Daylight Lodge and Tyles at 10.00am. Mark Installation will be held 3rd Saturday in May at 11.00am.